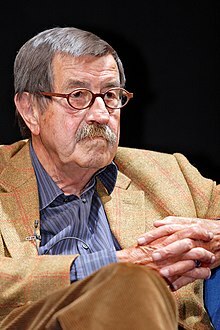 Günter Wilhelm Grass (16 October 1927 in Danzig (now Gdańsk, Poland) – 13 April 2015 in Lübeck) is a German writer and winner of the Nobel Prize in Literature. He was known for writing the controversial, but yet classic novel The Tin Drum. Grass was born in Danzig in 1927 and went to school there. In the World War II he had to serve in the military, afterwards he was a prisoner of war of the U.S. army. In 1945 and 1946 he worked as a stonemason. During the rise of Nazi Germany, Grass drafted into the Waffen-SS, the elite armed wing of the Nazi Party. He revealed this in 2006. He said if he had joined the armed wing when he was older, he would have faced war crimes. From 1946 he studied arts at the Kunstakademie Düsseldorf and the Berlin University of the Arts (Universität der Künste) in West Berlin. He was a member of the German group of writers known as group 47. He has lived in North Rhine-Westphalia, Berlin and Schleswig-Holstein. He lived in Lübeck. In 1959 he published The Tin Drum (Die Blechtrommel), his most famous work. Grass has always been interested in politics and helped in the election campaigns of the SPD. He was a friend of Willy Brandt. Grass was awarded the Nobel Prize in 1999. Grass died from a lung infection at his home in Lübeck, aged 87. ↑ "Günter Grass im Alter von 87 Jahren gestorben" (in German). 2015-04-13. Retrieved 2015-04-13. ↑ 2.0 2.1 2.2 "Günter Grass: From the Nazi Waffen-SS to the Nobel prize for literature". IBTimes.com. Retrieved August 5, 2015. ↑ "Renowned German author Günter Grass dies, aged 87". DW.de. Retrieved April 14, 2015. This page was last changed on 5 January 2018, at 08:39.